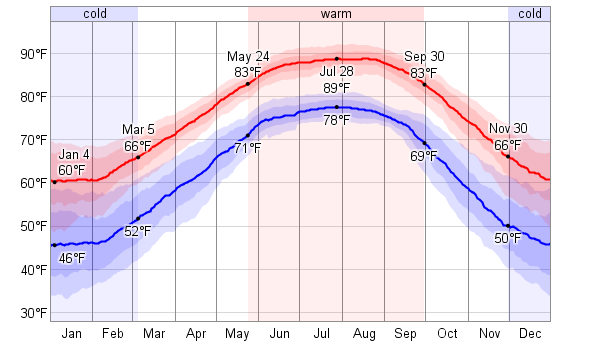 This report describes the typical weather at the Destin-Fort Walton Beach Airport (Destin, Florida, United States) weather station over the course of an average year. It is based on the historical records from 1998 to 2012. Earlier records are either unavailable or unreliable. Destin, Florida has a warm humid temperate climate with hot summers and no dry season. The area within 25 miles of this station is covered by oceans and seas (50%), croplands (38%), forests (8%), and grasslands (3%). Over the course of a year, the temperature typically varies from 46°F to 89°F and is rarely below 33° or above 92°F. Destin Florida average temperature graph. The warm season lasts from May 24 to September 30 with an average daily high temperature above83°F. The hottest day of the year is July 28, with an average high of 89°F and low of 78°F. The cold season lasts from November 30 to March 5 with an average daily high temperature below66°F. The coldest day of the year is January 5, with an average low of 46°F and high of 60°F.